— Lavery, Brian. “A Flying Hotel in the Fog.” Churchill Goes to War: Winston’s Wartime Journeys. Annapolis: Naval Institute Press, 2007. 94. This is Captain J.C. Kelly-Rogers, Berwick‘s commander for that flight (and the subsequent return flight from Bermuda to Britain). Regular readers of this space may find him familiar as I have used his likeness here previously as an avatar—a deliberate choice, as the man was one of Imperial Airways’ most experienced and capable captains. John Cecil Kelly-Rogers was born in 1905, in the seaside town of Dún Laoghaire, County Dublin. At the age of 14, he joined the training ship HMS Conway—famed for its high-quality merchant marine graduates—and later became an officer in the Royal Naval Reserve. In 1927 he joined the RAF and flew “army cooperation” craft; a loose term describing those aircraft that served as observers, artillery directors and couriers. Kelly-Rogers joined Imperial Airways (forerunner to BOAC) in 1935, and due to his good airmanship, experience and leadership, was frequently called upon for more hazardous and prestigious assignments. In 1937 he flew the first Empire flying-boat service along the Nile to Kisumu on Lake Victoria. He was in regular rotation as a captain on the lengthy Egypt-India-Australia route as well. In 1939, he flew Imperial’s first transatlantic service to Canada and the United States. Most famously, in 1940, Kelly-Rogers rescued the Empire flying-boat Corsair from the swamp in the Belgian Congo where it had lain stranded for 10 months. 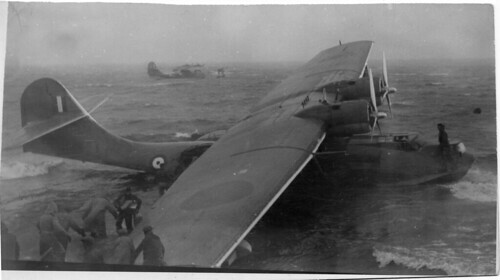 Corsair had gotten off-course due to faulty maintenance with its direction-finding radio; it was forced to land in a swampy, brackish river to avoid fuel exhaustion and had struck a rock and holed itself in the process. Captain Edward Samson Alcock—brother of famed Sir John William Alcock, who had made the world’s first successful transatlantic crossing—managed to beach Corsair before she flooded and sank. The flying-boat had subsequently been repaired in an Herculean effort that saw the creation of a small town full of engineers and hired African labour—nicknamed Corsairville, naturally. Regrettably Alcock wrecked it again on another rock, in an abortive attempt to get it airborne on the Dangu River’s narrow, short waterway, and Corsair was forced to spend another few months undergoing a second repair. For the second attempt, the river was dammed to create a lake, and ace pilot Kelly-Rogers was the man that finally got it airborne and back to Britain. Following the war, Kelly-Rogers returned to his native Ireland and became a pilot for Irish flag carrier Aer Lingus. He subsequently became a deputy general manager (and later, director) of the airline. In 1969 he also became the curator of an Irish aviation museum hosted at Dublin Airport. Unfortunately, to the best of my knowledge that museum no longer exists and the disposition of its artifacts is unknown. One has to presume as well that by the present date, J.C. Kelly-Rogers is dead, although I can find no notice of his passing. RELATED: Captain J.C. Kelly-Rogers gives his own impressions of the Prime Minister (and the flight from Bermuda to Britain) in the February 2, 1942 edition of LIFE magazine. 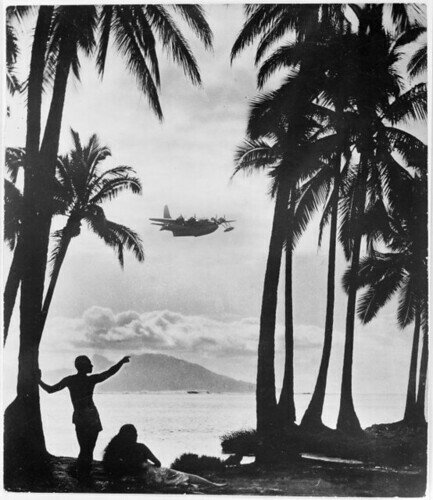 Papeete, Tahiti, [195-? ], originally uploaded by National Library of New Zealand. Can you spare a half-million for a fellow Canadian down on his luck? I will gladly pay you Tuesday for an historic flying boat today. Photographic proof that about seventy years ago, the Globe & Mail was once cool. The straight vertical windows on the control tower indicate that this photo was taken prior to the early 1950s, when the tower was upgraded with now-familiar sloping glass windows. The Grumman G-73 Mallard was only in production from 1946 through 1951, further narrowing the possible date of origin. This film is remarkable for several reasons, which are best enumerated and illustrated by reading through the Wisconsin Center for Film and Theater’s Foreign Correspondent online exhibit. But I’ll endeavour to give you a brief summary here. Director Alfred Hitchcock was able to spin a gripping and oddly prescient tale of a fictionalised Second World War—which at the time of filming had really only just begun. In fact the Tripartite Pact (establishing the formal alliance of Axis powers Germany, Italy and Japan) was signed a month after principal photography had wrapped. The film opened to U.S. audiences at the commencement of the Battle of Britain, and a scene in which the Germans bomb London was echoed a week later when the Germans actually bombed London for the first time in that conflict. The art director had to build reproductions of Waterloo Station, the Hotel Europe, two ocean liners, a large flying boat, and a 3-storey windmill. Locations in Europe had to be re-shot after the ocean liner carrying the original location footage was torpedoed by a U-boat. A full-scale mock-up of an Imperial Airways Empire flying boat was constructed, at a cost of $47,000. A crash scene involving the mock-up added $250,000 to the film’s eventual $1.48 million price tag. This film is definitely a priority in the growing list of films I need to see. James Kightly, journalist and author of the Vintage Aeroplane Writer, shows off the glamorous postwar conversion of Consolidated PBY-5A 34045 (civil registry N69043) to a Landseaire flying yacht. His informative and droll image captions are not to be missed. You’ll forgive me for marvelling at the aesthetics of film photography, flying boats and pleasant company, of course. For a fuller description of the amenities aboard these hedonistic craft, see Maurice F. Allward’s article “Airborne Yachts—Luxury Conversions of Wartime Catalinas” in the July 1953 issue of Flight International. Also see the full LIFE magazine archive of images of this craft, if you desire more. It would be hard to find a filmgoer who does not lament Hollywood’s recent obsession with cannibalizing itself, remaking the hits of yesteryear in a vain attempt to draw shrinking audiences to ever-more-expensive spectacles. Once in a blue moon these remakes are spectacular (like Christopher Nolan’s reboot of the Batman franchise); more often they are profound disappointments that only serve to remind us of the old aphorism that one really can’t go home again. I strongly suspect that Joe Carnahan’s A-Team film is going to fall squarely into the disappointment side of the divide. It’s based on a campy 1980s television show about an improbable premise; the show’s television plotlines regularly stretched the boundaries of credibility (something that its kiddie audience of the time could easily overlook; adults, less so); and Jessica Biel features in the cast of the new movie. If there is an internationally recognised signal for poor filmmaking, that signal is Ms. Biel. Yes, she is a very pretty woman, and we would doubtless extend her great courtesy should we ever make her acquaintance. But someone looking over her filmography could be forgiven for thinking that her agent is actually trying to destroy her career, with some success. PORT ALBERNI – The Hawaii Mars performed in front of the cameras Thursday, as the plane has a starring role in the big-screen version of the popular 1980’s TV show ‘The A-Team’. Large movie cameras were mounted on a pair of helicopters and also on boats, as the crew of Hawaii Mars performed multiple “touch-and-go” take-offs, landings and aerial maneuvers near Vancouver. …Originally, the second Coulson Flying Tanker ‘Phillipine Mars’ was supposed to do the flight since 20th Century Fox invested almost $200,000 to improve the planes airworthiness, with Hawaii Mars busy fighting fires in California. But as the filming schedule dragged on, the Hawaii Mars returned from Lake Elsinore and became available for the filming. …The BC Government has asked Coulson Water Tankers owner Wayne Coulson if the Hawaii Mars could perform a few water drops in Burrard Inlet during the upcoming Olympic festivities, so the break in filming allowed crew members to plan for the event. — Wiwchar, David. “Hawaii Mars Movie Star.” AlberniPortal.ca, 8 January 2010. The linked article also includes a small image of Port Alberni seen through Hawaii Mars‘ cockpit windows; I have reproduced it here so you may avoid the spoilers. 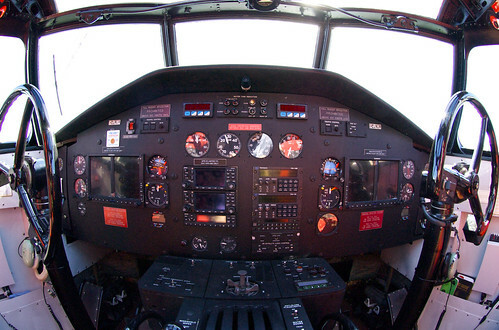 Mars Cockpit, originally uploaded by World Wide Murman. 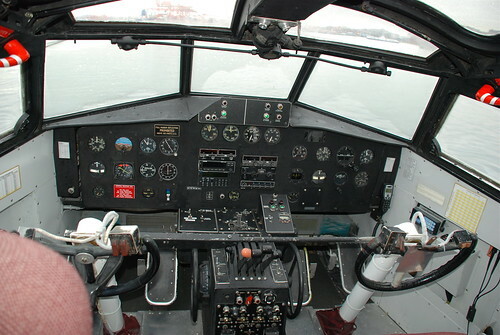 Compared to the July 2006 photos, the AlberniPortal.ca image seems to show a very nice retrofit of a Garmin G600 “glass cockpit” PFD/MFD combination, plus new components in the radio stack. The flying-boat’s role in February’s Winter Olympics is also noteworthy; I wonder if it part of the opening ceremonies, or merely a sideshow to keep people entertained during the actual sporting events. MYSTERY SOLVED: Flickr user Tom Harnish has captured a more recent (October 2009) image of Hawaii Mars‘ instrument panel. The PFD/MFD pair is definitely a Garmin G600 system. The separate NAV/COM/ADF transceivers have been replaced by a pair of Garmin GNS 430Ws; these are all-in-one GPS/Nav/Com solutions. The existing Technisonic TFM-138 VHF transceiver has been supplemented with an additional (and newer) TFM-138B model, and the XPDR is now a Garmin GTX 330 (or its lesser but similarly-styled sibling, the GTX 327). Not a bad facelift for a plane that was built before even basic VORs were invented. The Bridge, originally uploaded by TailspinT. RELATED: The trailer for the A-Team film; scheduled for release June 11th, 2010.